Add some zest to your next summer cookout with these lip-smackingly good Lemon and Oregano Chicken Skewers. If you don’t have a grill, or your too scared to operate it (raises hand), you can also pop them under the broiler and they will be just as amazing, if not a little less charred. Picture yourself sitting in the backyard, feet up, wine in hand and the hubby cooking away on the grill while you actually get to just sit there and relax. I did this for reals this past weekend! Yup, I enjoyed a glass of wine all by myself while the hubby cooked and the kids raced their scooters up and down the path. Pure bliss. Eating outside is definitely in the top three of my list of favorite things about spring and summer months. Everyone is just so much more happy and chilled when the sun is out, the food is fresh and light, and the dog is there to clean up the mess on the ground afterwards. Lemon and Oregano Chicken Skewers can be prepped in advance. In fact, they actually benefit from a couple of hours marinading in the oregano mixture, so prepping in advance is a huge plus. The flavor combo has a very Mediterranean-esque feel about it, and definitely pairs well with the sun and a nice glass of something cold; I for one am going with a nice white wine, but you do you. Sprinkle with a generous amount of feta and serve alongside a nice light salad and you have the perfect meal for a chilled summer night. If you don’t have a grill, or you don’t like to use the grill (we only grill if hubby is home, that thing scares me), then just pop them under the broiler inside, and they will be just as great. You won’t get that nice charring, but you won’t mind because of the flavor explosion you have going on in your mouth! 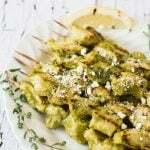 If you try out my lemon and oregano chicken skewers then be sure to pop back and leave a comment letting me know how you went, I always love to hear from you. Happy eating. Add some zest to your next summer cookout with these lip-smackingly good Lemon and Oregano Chicken Skewers. If you don't have a grill, or your too scared to operate it (raises hand), you can also pop them under the broiler and they will be just as amazing, if not a little less charred. Add oregano, parmesan, garlic, almonds and salt and pepper to the bowl of a food processor and pulse until the mixture is slightly combined. Add in the lemon juice and combine. Cut the chicken into bite sized pieces (about 1 inch long) and throw into a large gallon sized ziplock bag. Add in the lemon and pesto mixture and as much olive oil as needed to make the pesto 'spreadable'. I used about an extra 1 tbsp. Massage the pesto into the chicken until well coated. Pop the ziplock bag containing the chicken into the fridge and allow to marinate for at least an hour, up to overnight. Remove the chicken from the bag and thread onto skewers (if you are using wooden skewers remember to soak them in water for about 30 mins before using). Cook on a preheated grill at 450F for about 4 mins on each side. Alternatively, pop them under a broiler at high heat and cook for 4 mins each side. Sprinkle with some crumbled feta and chilli flakes. Serve and enjoy. 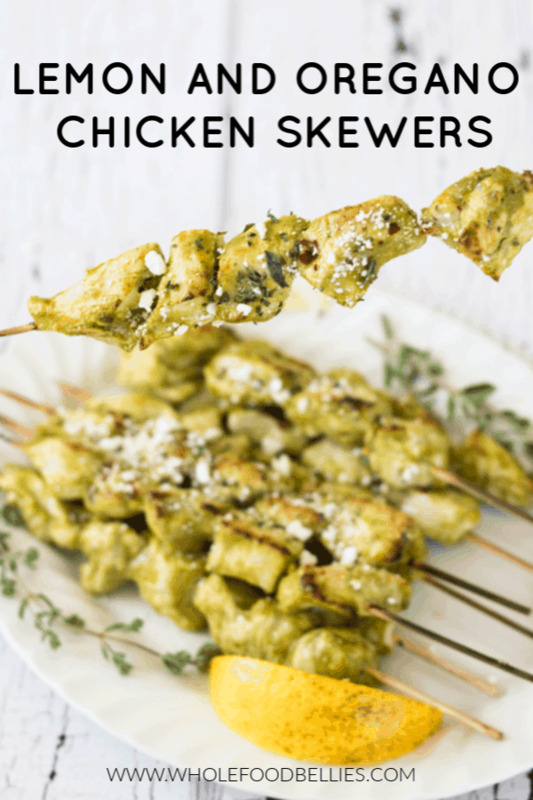 I absolutely love the flavors in these chicken skewers! We got a new grill this year, so I’ve been grilling everything and this will be up next. Such a great touch to add crumbled Feta before serving, too. YUM! Oh the feta is everything, it just enhances the other flavors so so much. I saw these on Friday and had them at our bbq on Sunday! They were fabulous! Easy to marinate all day, paired with a glass of chilled prossecco…. it was a beautiful Sunday Dinner! I really like the spice and the lemongrass used. You got a great color on your skewers. Love all the fresh Mediterranean-style flavor in this recipe! I am so happy grilling season is here. Now if we could get more than 1 day at at time without rain that would help. These skewers look like the perfect BBQ party food….easy to make and easy to eat. Letting someone else cook dinner is the best kind of dinner there is! The flavor combo of Lemon & Oregano sounds so good! I’m always looking for delish flavor combos for the grill. Oregano and lemon is next on my list to try! Yum! It is such a nice combination, so fresh and summery! Served up with feta–this is perfect chicken dinner. Yummy. I want to make these. I don’t have a grill so I’ll make them in my oven but I bet they will become my new favorite!! (I’m scared of grills too!) 😉 These chicken skewers look so fabulous! !